Winter Spinning Interlude: Thanks to JoJo for guidance and inspiration from the very beginning, I started spinning for relaxation and fun a few years ago. I have been a bit inconsistent in my commitment to building basic skills, but I would currently categorize myself as an novice-intermediate spinner. 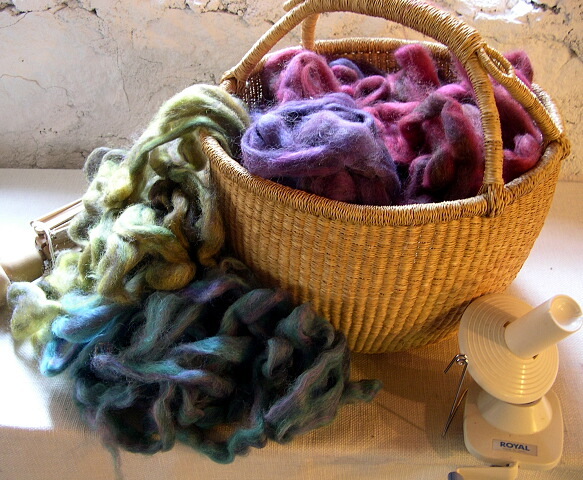 Fiber lovers have a hard time saying “no” to more fiber…and so it is that I have accumulated a good deal of bulk fiber for spinning and felting. Last Fall I purchased a lovely collection of mohair and wool fibers from Steam Valley in Pennsylvania (www.steamvalleyfiber.com) with names like “Sedona Blue” and “Iris” and “Pansies”. I don’t have much (probably 3.5 pounds or so) but I would like to make room for more (hee hee, she says with glee)!! So…my challenge for the Winter is to spin the remaining fiber and make it into something (or at least begin a project). Since I am equally inconsistent when it comes to making time for casual needlework, I was looking for a simple project (but one that incorporated as much color as I could stand and allowed for some stitch modification). I found it in The Ashford Book of Spinning by Anne Field. It’s a basic crocheted afghan (we all love a good afghan project right??)! Something I can pick up at anytime and jump right into. So, THE PLAN (for the benefit of anyone not familiar with the spinning process): 1) The spinning: I’ll be mostly spinning singles. I have been spinning a medium weight yarn, roughly 15 wraps per inch (wpi). I would like to produce something closer to 10-12 wpi for the afghan project. It could actually be bulkier, but since I have already spun a medium fiber to date, I want it all to be somewhat consistent. 2) Washing and weighting: after winding off, I will periodically wet out a group of skeins in cold water so as to retain some of the “greasy” quality of the fiber (since the piece might be worn outside). 3) Winding balls: When all the fiber is dry, I will put each skein on my umbrella swift and wind each into a nice ball for work later. I’ll check back in periodically to share my progress.